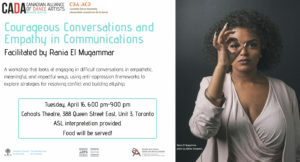 Courageous Conversations and Empathy in Communications on April 16 2019 from 6 pm to 7 pm will have ASL Interpretation. This workshop explores engaging in difficult conversations in empathetic, meaningful and impactful ways. The session uses anti-oppression frameworks to explore strategies for resolving conflict and building allyship. The session uses World Cafe facilitation methodology through participant led modules as well as facilitator led exercises. Participants will learn skills around initiating a difficult conversation, ending a difficult conversation and moving through conflict and discomfort. Empathy in communications is a core anti-oppression value anchoring this workshop, Through an understanding of empathy and its critical role in fostering fruitful discussions, participants will gain applicable skills in conflict resolution and emotional literacy. The event will be held at Cahoots Theatre on 388 Queen Street East, Unit 3 (off Trefann Street). There is an accessible streetcar stop at Queen Street East and Parliament Street and an accessible bus stop at Parliament Street and Queen Street East. 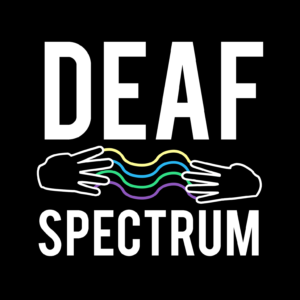 The venue is fully accessible and this event is free.